Is it only the elongated slit that was sealed by Muslim? This kind of elongated windows(?) are seen in the castles of the UK and it is also the thing which are often seen in the rocky castles. I was told the thoughts of Stone human went out of this slit. According to 'THE UNIVERSE(THE SKY)=SORA' the young fish of the eel expresses it, and I have often seen the persons with elongated faces and bodies in Israel. 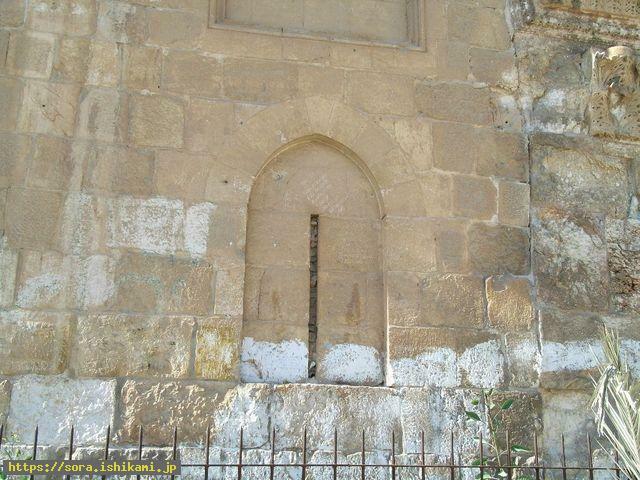 I was also told it shows that thoughts of Stone human came out of the narrow slit of the door. I saw a vision in which a giant like a stick was seen and it showed that giant became this castle wall. I was told this is the child Stone god of Mt. Olives. When I shot here from Mt. Olives the camera captured round fluorescent light-shaped energy body and seven colored radial light which occupied half of the above screen. Those are the energy bodies of Islam and the door doesn't open as those energy bodies issue instructions to atoms to hold hands securely, I was told.